What came to be referred to, pejoratively, as Bubblegum Music emerged from, and was a response to, psychedelia. The acknowledged masters of this form of pop music were Jerry Kasenetz and Jeff Katz (known as Super K Productions), who were to Bubblegum music what Alan Parsons was to psychedelic rock. Under the banner of Super K Productions, Kasenetz-Katz were responsible for hits such as “Simon Says” by The 1910 Fruitgum Company and “Yummy, Yummy, Yummy” by the Ohio Express, both released in 1968. In my mind, though, Bubblegum’s first big hit was recorded by The Cowsills, who, as everyone knows, became the model for the musical family depicted in the TV show The Partridge Family (1970-74). The hit, released late in 1967, was titled “The Rain, The Park & Other Things.” It was written by Artie Kornfeld and Steve Duboff, who’d also written the hit “The Pied Piper” for Crispian St. Peters. Flowers in her hair, flowers everywhere! I love the flower girl! Was she reality or just a dream to me? Betraying Bubblegum’s psychedelic origins, the singer is unsure whether he’s just experienced something real or an hallucination. “The Rain, The Park & Other Things” can also be understood as a benign version of The Association’s “Along Comes Mary” with its supposedly cloaked drug reference (“Mary,” so the story goes, is short for “Mary Jane,” one of the many coded names for marijuana). I never knew that Artie Kornfeld co-wrote "The Rain, the Park and Other Things"! No wonder he (a co-producer of the Woodstock festival in 1969) looks so blissed out while standing onstage and rapping to the ABC newsman about all the people sitting in the rain in the WOODSTOCK movie. His rap is the one Charlton Heston has memorized in THE OMEGA MAN. The Cowsills may have been a bubble gum act by definition, but I would personally categorize their performance of this song as psychedelia. There is no insincerity or irony in the vocals, for one thing, and the instrumentation has a wonderfully irridescent quality. Wholesome yes, but psychedelic nonetheless -- like a black light poster or a strawberry scented candle. 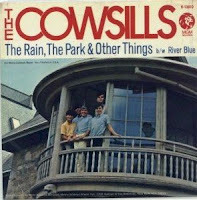 I think the Cowsills' (cleaned-up) cover of "Hair" also works as wholesome psychedelia -- listen to the sound effects during the "It can get caught in the trees" stanza -- but "Indian Lake" is unabashed bubble gum. You remind me that the last Top 40 single I ever bought was "Quick Joey Small" in 1969. After that, I went over the wall myself and got into LPs -- Steppenwolf, Jefferson Airplane and Blue Cheer. Oh yes, and the WOODSTOCK soundtrack. One of the things that drove bubblegum music was the need for something new in the marketplace. FM radio was raising, popularizing album cuts rather then singles which were the mainstain of TOP 40 AM radio. FM had taken the TOP 40's audience with them who were now out of high and moving on. Bubblegum replaced it. Its appeal, demographically was to the younger brothers and sisters of the one's who were blissing out to Pink Floyd, Led Zepplin, and The Grateful Dead. The content of short, bouncy, hook ridden music with touches of psychedlia was brainchilded by Super K Productions at Neil Bogarts' Kama Sutra records. Bogart would later start Casablanca Records, home for KISS, and Donna Summer, both acts who could have fit nicely into the heydey of bubblegum. Psychedelia in bubblegum to me was a 'sound' that the producers pulled on as much as the organ keyboards or the vocals of Ron Dante, who appear on the Archies, The Cufflinks, and eventually, produced most of Barry Manilow's hits. Kornfeld was as 'psychedelized' song writer as one of the time. Pick up a copy of "Barefoot in Babylon" a wonderful memoir/hisotry of Woodstock and beyond. Currently, I have heard that bubblegum is getting a fresh look from a cultural/popular viewpoint. One past the distain that it had be many when it was the fresh thing filling the AM airwaves. I am looking forward to seeing more here and it spreading influnces that both you and Tim Lucas are demonstrating.